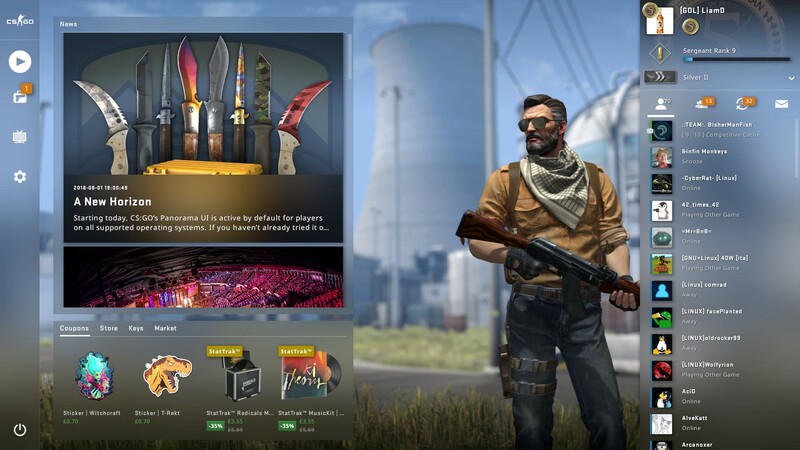 Valve's massive update to the interface for Counter-Strike: Global Offensive [Steam] is now officially live for everyone, no longer needing a launch option to be set. This came with a big set of bug fixes, so hopefully it's more stable for those of you who had issues. If you have issues with the new interface, you can add "-scaleform" as a launch option to see the original. However, this will only be available for a limited time. Not honestly sure why you would want to use the old one, unless there's open bugs Valve haven't yet solved as it's a huge improvement. In addition, the latest update also brings in some gameplay updates. When planting C4 at bomb site B, it will now emit a different sound, molotovs and incendiary grenades will now consistently deal impact damage so that it matches other types of grenades and there's also a new Horizon Case, featuring 17 new community weapon finishes and 4 brand new knives. Don't forget, Valve is just a small indie company with at most two developers. Tried the panorama changes on linux about two weeks ago and found quite a few glaring bugs in it. The main one being if you change video quality settings it will freeze the screen until you alt-tab out and back in (got flashed the split second before I applied the change, made it quite obvious). Will have to give the release version a spin to see if valve caught it. To give credit where credit is due panorama runs quite nice on linux. I have been using the panoramic UI since it went into beta. it is a really nice overhaul. Wasn't CS:GO meant to goto Vulkan and source2 like DOTA2 did? This also comes with fixes for the UI elements at 21:9 aspect ratios!!!! Amazing. (Before when entering a game the old UI would be out of screen...so it would be hard to click "continue." and other annoying bugs like that). In case it crashes on startup: I had to stop xboxdrv to get it working. Maybe this helps you. i'm using 4.9.124-3-MANJARO, anyone knows how to disable panorama ui or fix the problem ?